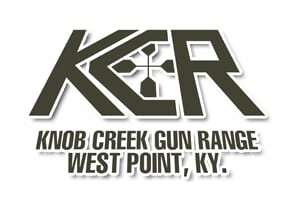 The Knob Creek Machine Gun Shoot & Military Gun Show is a bi-annual event held at the Knob Creek Gun Range in West Point, Kentucky. The event brings together machine gun dealers, collectors and enthusiasts from all over the country. The Machine Gun Shoot consists of three days of machine gun shooting, dealer displays, shooting competitions and a Saturday Night Shoot.